The crisp California spring evening of March 15th started off with the melodic voice of Mystic Marley, granddaughter of the great Bob Marley and daughter of headliner Stephen Marley. The intimate outdoor setting of Garden Amp was the perfect venue for continued support of her 2018 single “Beatdown”. Mystic showed up in true Marley form: her dance vibes and strong voice got the crowd moving. Stephen Marley took to the stage in front of the large sold out crowd. His strong set varied from his own music, like “Mind Control”, to some of his father’s greatest hits, like “Small Axe” and “Three Little Birds” that had the crowd singing along. Later, Mystic joined her father Stephen onstage to perform a few of her grandfather’s songs, as well. The two continue to tour together, igniting stages across the country. You will not want to miss them! The Caribbean sun radiated high in the sky as Saturday morning brunch began at the VIP Bask area of KAABOO Cayman 2019. VIP guests were promised an exclusive KAABOO kick-off party Thursday night before the inaugural fest opened its gates the following day; extreme weather had other plans. Not to worry! VIP patrons received an update that up-and-coming crowd favorite Stealing Oceans will have a morning set Day Two with complimentary bottomless beverages and finger food. Of course, the high-energy, acrobatic and all-out entertaining Stealing Oceans boys stole the show once again, making the crowd sweaty from dancing by noon. Back on the main grounds, Caribbean reggae artists Shameka Clarke and Romain Virgo got the two stages up and running from a night's hiatus before HIRIE and Salt-N-Pepa welcomed crowds with sing-along hits. Bluegrass legends Blues Traveler wowed the audience next, with jam band qualities and signature harmonica solos. The masses then flocked to the main stage for Shaggy before Blondie came out caped and captivating. +Live+ had die hard fans rocking out in the front row before Sean Paul got the dance party going again. Speaking of dance party, Zedd blasted the fest into outer space with pyrotechnics, steam pillars and fireworks bursting overhead. Pop star Jason Derulo and his bejeweled dancers continued the high until headliners Duran Duran finished out the firset year fest in style. Until next year, this publication will be Cayman Island dreaming. There was no better way to celebrate the first sun-filled Sunday in southern California than to hang with Kyle Smith and The B Foundation! Fans packed the patio at The Slidebar Rock 'n Roll Kitchen in Fullerton to soak up the smooth sounds and groove to the rocking rhythms. To start of the evening, Kyle Smith and his talented band took to the stage. With a solid horn section with a bass and drums backing him, Kyle’s guitar playing and vocals shone bright. The band got the crowd going and singing along to their favorites, as the band played their latest single, “Astray”. The B Foundation was up next and kept the energy going, as family and fans surrounded the stage. Fans shouted requests of their favorite B Foundation songs, while the band surprised the crowd with a cover of “Kiss The Girl” from The Little Mermaid soundtrack for their younger fans… and a few older ones too! In our previous interview with Th3rd Coast Roots, we discussed new music to be released and it is with great pleasure that we announce their latest single, “Lovers Rock” — now available for download! Th3rd Coast Roots could not be happier to share this dynamic new single with their fans. “Lovers Rock”, with its pop-style lyrical structure and content blended with what the band calls “future roots rock reggae”, will give their listeners a preview of what more musical creations are coming their way. “Lovers Rock” is now available on all major streaming platforms and be sure to follow Th3rd Coast Roots on Facebook and Instagram for new music updates! KAABOO has turned into quite a franchise for 2019, following a successful sold out KAABOO Cayman in February and with an inaugural KAABOO Texas lingering in the near future at the Dallas Cowboys AT&T Stadium this May. These sister fests wouldn't have been conceived without KAABOO taking place four festive and favored years at San Diego's Del Mar Fairgrounds, each packing unforgettable memories and sold out crowds. Now that KAABOO Del Mar is in its fifth year, branching out is finally possible… and the rest of the nation gives thanks to that! KAABOO is quickly taking over the world and fans of the fest can't wait to see what new locations 2020 may bring to light. … you cannot outdo KAABOO. It's the most impressive party of the year. Period. 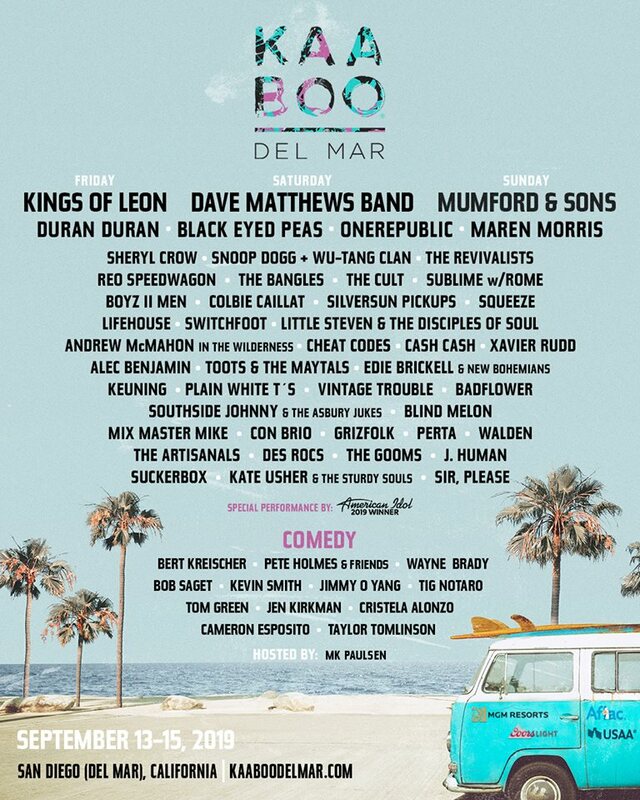 In the meantime, OG KAABOO fans have waited since the conclusion of KAABOO Del Mar 4 to see who will be attached to the 5th Annual this September 13th-15th, 2019. Many sprung for early bird passes, all of which sold out accordingly. What was revealed today may have shocked some, but most see the lineup for what it is — a perfectly-balanced work of pure festival genius. Sure, headliners are hard to beat year over year; KAABOO 3 boasted Tom Petty's fourth last performance before his unexpected passing! That's a pretty high pedastal to uphold. Plus, more and more festivals keep sprouting up every year, all trying to undercut each other's performance artists. The competition is steep, to say the least. All that in mind, true KAABOO-ers know it's not about the lineup, it's about the experience. The 'MIX-perience', as KAABOO puts it. With legendary acts from all musical genres coming together in between live art installations, A-grade comedians, tasty top chefs and all the amenities you could possibly imagine, you cannot outdo KAABOO. It's the most impressive party of the year. Period. So, millenials, if you're not pleased with the lineup — your loss! Sure, Biebs and Bey aren't headlining… but GRAMMY-winners Dave Matthews Band, Kings Of Leon and Mumford and Sons are. Snooze fest, you accuse? Have you seen Kings Of Leon perform?? Their set is on fire. How about when Black Eyed Peas gets it started reciting decades of mega hits after deejays Cheat Codes and Cash Cash start midday dance parties? Y'all are crazy if you even think about sleeping on KAABOO 5. If you're still indignant that Coachella does it better, the FOMO is bound to smack you hard once KAABOO weekend comes along and all your friends are there. Because, let's face it, Year 5 is as diverse as it gets (in true KAABOO fashion). Fans of reggae can soak in world music vibes by Xavier Rudd, Cali reggae-rock anthems from Sublime With Rome and the classic roots of Toots and the Maytals. Hip hop lovers get a Snoop Dogg/Wu-Tang mashup as well as Top 40 hits from Boyz II Men bringing the early 90s back. Speaking of 90s nostalgia, Sheryl Crow, Blind Melon and Squeeze will cover most your guilty pleasure playlist this year. Want to take it even further back? Reminesce in the 80s with Duran Duran, The Cult, The Bangles, REO Speedwagon and Mix Master Mike making an appearance sans his Beastie Boy brothers. Want more recent stuff to jam to? Rock of the 2000s is represented quite a bit between Lifehouse, Switchfoot, Silversun Pickups and Plain White T's. Hey there Delilah, indeed. And, despite what haters on the interwebs are saying, modern alt-rock music will be more than present and accounted for with performances by The Revivalists, ONEREPUBLIC, Alec Benjamin, Keuning, Suckerbox and so many more. Even country lovers get Maren Morris. With more local acts to be announced, let's talk funny business. Top comedy acts are returning to the KAABOO 'Humor Me' Stage this September, including everybody's favorite foul-mouthed family man Bob Saget and the most underrated filmmaking Rennaisance man in the business, Mr. Kevin Smith. More laugh-out-loud acts are Bert Kreischer, Pete Holmes (and friends), Wayne Brady, Jimmy O Yang, Tig Notaro, Tom Green, Jen Kirkman, Cristela Alonzo, Cameron Esposito and Taylor Tomlinson. Get ready to ROFL, Del Mar. With so much more to be revealed, including the culinary and BASK lineups, it's time to get your tickets before KAABOO 5 sells out! And, like every year preceding it, it's going to. For more information or to get your passes now, visit the links below or www.kaaboodelmar.com. In the summer of 1969, friends, lovers, dancers, jokers, smokers and midnight tokers trekked from near and far for what was destined to be a legendary weekend of peace, love and music. 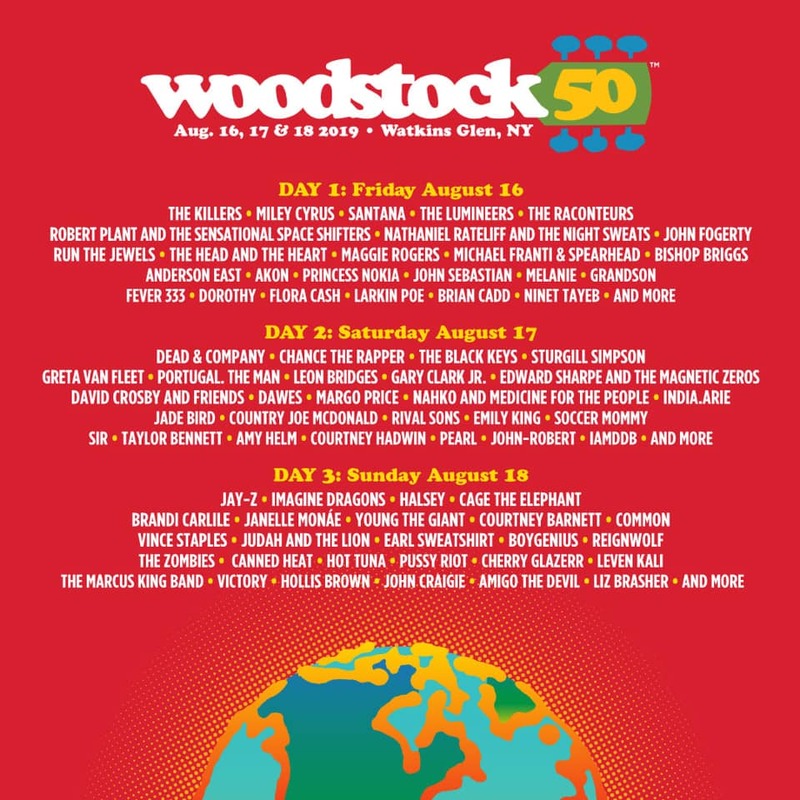 Woodstock has since become a cornerstone experience for festivalgoers, tree-huggers and peace lovers and now, exactly 50 years later, you can be a part of the movement this August 16th-18th for Woodstock 50 in Watkins Glen, NY! The lineup is stacked with familiar names from every genre on your playlists, featuring The Killers, Dead & Company, Imagine Dragons, Jay-Z, Miley Cyrus, The Black Keys, The Head and The Heart, Chance the Rapper, Robert Plant and the Sensational Space Shifters, Common, Cage the Elephant, Nahko and Medicine for the People, Leon Bridges, Santana, Run The Jewels, Gary Clark Jr., Earl Sweatshirt, Janelle Monaé, Soccer Mommy, Michael Franti & Spearhead… just to skim the surface. Music and art may be the focal material, but the celebration goes so much further than that in its call to action. Woodstock 50 is supporting causes that represent current and recurring issues by working with organizations like Conservation International, Happy Hippies, Head Count, Hiring America, The Felix Organization, March for our Lives, Reform, Social Works and The Dolphin Project. Woodstock 50 feels like a blast from the past, yet oh so applicable today due to social and political similarities at this nation's forefront. Organizers, performers and dreamers alike can hope that the same waves of conciousness are streamed throughout event grounds and Woodstock 50 holds as much potency in promoting change as its predecessors. John Fogerty and members of The Grateful Dead provide a certain je ne sais quoi to the overall atmosphere of Woodstock and its mission. The world still has work to do, but getting the right groups of humans together for the right reasons gives us hope that the music will never stop and that it is possible to grow out of oppression into a more inclusive and loving way of life. Rap star Common says he is happy to represent hip hop music at Woodstock 50 and be a part of a festival that not only focuses on music, but has a strong social and political presence. Rebel Sound Records and Top Shelf proudly present the latest music video from roots-reggae chanteuse Ione Angeles! The track entitled “Walk Away” is off of Angeles' Inna Word album and features the talents of Jah-Know Wright. Now equipped with a music video, Ione Angeles traverses a picturesque shoreline as she preaches salvation to all. Ione Angeles traverses a picturesque shoreline as she preaches salvation to all. Angeles chants “there is a space for us in the universal mind”, far from the disillusionment of society and all of its establishments. Cast off your social networks, break free from government oppression and just simply “walk away” to an elevated way of living. Consciousness is up to you. Just keep Jah in your heart as you meander from the “negative frame” that has grown to be the norm. Want to jump on the exodus, but don't know where to start? Angeles says “watch me” as she is a prime example. On Sunday February 17th, Special Blend headlined the Reggae Sunday show at the Slidebar Rock n' Roll Kitchen with support from The Good Tones. The Good Tones came on first and their high energy combined with great stage presence got the crowd ready for a rily reggae time. Two band members, Nick and Tommy, happened to be rocking identical 17th Street Recording Studio shirts too, giving silent props to the main mixing master responsible for some of the most successful reggae rock albums to date, Mr. Lewis Richards. Special Blend then came on to close the night with their signature fun and energetic show, forcing the crowd to spend the rest of their time dancing and singing. There are few things better than tacos, beer and punk rock music… let alone an event celebrating all three. Hitting three U.S. cities in April comes Sabroso Craft Beer & Taco Fest, bound to hit the sandy shores of Doheny State Beach of Dana Point this upcoming April 6th and 7th. Unlike the latter two cities on the taco fest circuit, Salt Lake City and Denver, Sabroso Dana Point spans two full days of beer tastings, mosh pits and more. And, when we say more, we mean it. On top of the biggest puck rock bands in the business, Sabroso welcomes famed Lucha Libre wrestlers from around the world to compete for the “King of the Ring” Sabroso title. Back to defend his 2018 Sabroso reign is Cesar Gonzalez, better known as 'Ramses': the villian wrestler in the late night south of the border comedy Nacho Libre starring Jack Black. Let the masked and caped smackdown commence. Also competing are all the local taco eateries, with Sabroso attendees voting for 'Best Taco' amongst the musical madness. If that isn't enough for you, over 150 craft beer selections will be on the grounds offering unlimited tastings until 4pm! That's three full hours of beer while the musical stages start up. You're going to want to have a nice buzz going too, since Irish rockers Flogging Molly are set to headline Saturday night while punk rockers The Offspring will have the circle pit going steadily into Sunday night. Joining the Day One rundown is Bad Religion, Good Charlotte, Lagwagon, Strung Out, The Sucide Machines and openers D.I. kicking it all off. Sunday is no different, starting with Orange Blossom Special and graduating to The Offspring with Red City Radio, Plague Vendor, Face To Face, Black Flag and Descendents… in ascending order, that is. All of this powered by everyone's favorite (and America's most underrated) hot sauce, Gringo Bandito, begs the question, how could you possibly have a bad time? For those that have spouted a family since their love originated for the majority of these bands, don't worry, all ages are welcome. Save a buck by bringing the kids too, since kids under seven are free with a ticketed adult! Speacking of tickets, general admission weekend tickets start as low as $89.50 at this time, with single day options available if you prefer less of a commitment. VIP packages range from $109.50 single day to the ultimate Sabroso hang with the Eat & Greet VIP pass, only available for Sunday where you're guaranteed a personal meet and greet with select members of The Offspring. Since the party goes down at a state beach, make sure to grab a $10 weekend shuttle pass while you're at it. 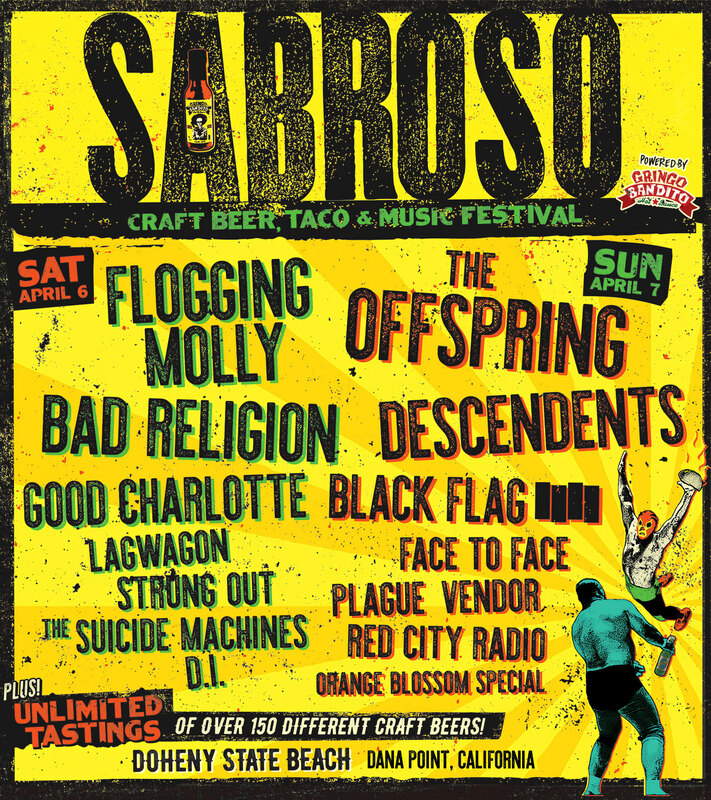 For more information or to get your tickets now, visit www.sabrosotacofest.com. On February 16th, Burritos the Band headlined at The Wayfarer in Costa Mesa, CA. The Sublime cover band was supported by Audio Empire and LAW Records artists Vana Liya and Tunnel Vison. The show opened with Vana Liya, who got the crowed warmed up and ready for the night. This was my first time seeing her and have to say Vana killed it — I really enjoyed her energy! Next came Audio Empire, who were on fire before Tunnel Vision took the stage. That band is always a blast to see. The night closed out with Burritos the Band blowing the doors of The Wayfarer. There was so much dancing and singing to all our favorite Sublime songs, with show proceeds from going to support The Nowell Family Foundation. For more information or to donate to The Nowell Family Foundation, click here.